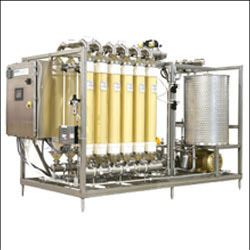 Our organization is statured amongst the pioneer organizations affianced in manufacturing, exporting and supplying a wide assortment of Micro Filtration Systems. In adherence with the latest market trends and developments these products are well recognized for their superior functionality and hassle free operations. Micro filtration systems from Evoqua offer a cost effective and sustainable solution for water, waste water and reuse applications. With decades of R&D devoted to polymeric micro filtration membranes, micro filtration systems engineering, and thousands of installations, you can rely on Evoqua for your most demanding liquid separation and purification needs using micro filtration. It is a filtration using porous films/ materials with pores in the region of 0.1-10.0 microns. 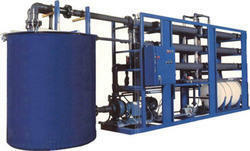 Micro Filtration process consists of sediment cartridge which filters impurities up to 1 micron. Many schemes are present for micro filtration. It contains a sediment cartridge which filters impurities up to 1 micron. Almost 90% bacteria get eliminated in this micron filter. This Micron Filtration Plant are widely used by our clients and appreciated for their features like Consistent performance, Easy unit assembly, Facilitates continuous filtration, SC Low maintenance. These are available to our clients with accurate dimensions and offers high durability. These are available at affordable prices to our customers. With a main aim to accomplish high level of patron trust, we have been engrossed in providing a vast assortment of Microfiltration System. Owing to perfection and quality oriented approach, we are instrumental in providing world class Micro Filtration System. Our name is counted amongst trusted and leading companies for offering a large range of Micro Filtration System. Used in water, beverage and other applications areas, our product is widely known. Moreover, the Micro Filtration System we offer is used for filtering applications.